The Minnesota Twins are starting to reassemble their coaching staff after blowing up the group after the 2014 season. At least one position was filled when the decision was made to retain hitting coach Tom Brunansky. Brunansky absorbs all of the data and analytics but has the ability to translate that into a practice his hitters can understand and take into a game. Now, hiring a pitching coach that would operate in the same guise as Brunansky would be ideal.Pitching has been a significant issue for the organization as the team floundered its way to four consecutive 90-loss seasons. Although replacement-level personnel has played a significant factor in the pitching results, the Twins have failed to adapt to the changes in the game around them. And part of that may be sourced back to former pitching coach Rick Anderson. In 2008, Anderson provided a scouting report of his young pitching staff that emphasized keeping the ball down in the zone. Specifically, for Kevin Slowey and Scott Baker, Anderson said keeping the fastball down was critical for success. In 2010, Anderson reiterated this belief. But Anderson was not alone in his assessment. On almost every broadcast, FSN and former pitcher Bert Blyleven would echo this as well. However, at least in Baker’s case, the inverse was actually true. From 2009 on, opponents hit .227 and struck out on 24% of their plate appearances while facing fastballs up in the zone against Baker. On the other hand, they batted .288 with strikeouts on 11% of their plate appearances on fastballs down. His success was found just below the letters. For Anderson and Blyleven, the mantra of shooting the knees and maintaining a downward plane may have been true during their era of pitching but the game has evolved beyond the notion that you have to live down in the zone with your fastball to survive. In fact, it is more detrimental if you do. While the rest of baseball was fawning over ground ball pitchers, the Oakland A’s ran the other direction and loaded their lineups with hitters who exhibit fly ball tendencies and uppercut swings -- a practice that would combat the downward action of sinkers and two-seam fastballs which live down in the zone. With that method, it is probably no surprise to learn that the A’s led baseball in hardest hit fastballs down in the zone (.212 hard-hit average) and put 26% in play as fly balls (well above the league average of 21%). Meanwhile, this uppercutting offense struggled to generate power on fastballs up in the zone, slugging just .293 -- the lowest in the American League. And it is not just Oakland that is having more success versus fastballs down in the zone compared to those left up. This past year the league batted .216/.331/.344 on fastballs above the waist while they managed a superior .283/.387/.409 on fastballs from mid-thigh and below. There are various reasons for this outcome. The first being a tenet of a Perry Husband’s theory of Effective Velocity. The reason why hitters often say a pitcher’s high fastball seemed to have more giddyup is because, as Husband’s research suggests, a hitter’s bat needs to travel further to make contact -- particularly up-and-in and middle-up above the strike zone. By locating a fastball properly, a pitcher’s heater can gain 1-to-5 miles an hour of Effective Velocity. While the majority of the baseball world was teaching downward plane, the UCLA Bruins found success in the NCAA by going up in the zone. Most notably, with current Cleveland Indians pitcher Trevor Bauer and then with Adam Plutko later in 2013. The Bruins pitchers aimed for what they call the “one spot” -- an elevated letter-high fastball out over the plate -- visiting that location in two-strike counts. "It’s why [former Mets starter] Sid Fernandez had success,” current Astros pitching coach Brett Strom told Husband. “Everybody wants a 6'5 guy, but hitters have been conditioned for ages for a ball to be in a certain spot, from a downward plane. Fernandez sat really deep on his back leg and had a low release point. Hitters couldn’t adjust." The second reason is the increase in the number of pitchers trained to work downhill. As a response, more hitters are conditioned to look for pitches down in the zone. For instance, Husband studied Mike Trout’s data closely and found that the superstar did not chase after fastballs up in the zone. It would appear that Trout, who can typically hit everything, at anytime and pitched anywhere, knew his limitations. Like Young, Oakland’s closer Sean Doolittle adjusted his approach after video scouting revealed that opponents were jumping all over his fastball down in the zone. He ditched that for fastballs above the belt. "As long as most guys have been teaching pitching, you want to live at the knees and then maybe expand up with two strikes," Doolittle said. "But I've had more success throwing pitches up in the zone." The benefits of pitching down in the zone include a higher percentage of ground balls, but using a fastball up in the zone leads to more fly balls and infield pop-ups that are converted into outs more often than grounders. Are more home runs allowed on pitches up in the zone? Slightly. In 2014, 2.5% of all at-bats on fastballs up in the zone resulted in a home run compared to 2.0% of at-bats that resulted in a home run on pitches down in the zone. That said, hitters swing and miss on 11% of fastballs up in the zone while they do so on just 4% of fastballs down. Lower batting average, higher out-percentage and a better opportunity to miss bats certainly makes this an intriguing idea. Not every pitcher is designed to be a high-ball pitcher, to be sure. Pitchers like Kyle Gibson, who has a power sinker, is not likely to suddenly become a pitcher who targets the top of the strike zone. That said, pitching up in the zone shouldn’t be treated like a problem either, particularly while developing pitchers in the minor leagues. Heading into the 2014 season, Twins farm director Brad Steil made this statement regarding Trevor May: “For him to get better, it's going to be pitching down in the zone with his fastball. When he gets in trouble, he leaves the ball up above the belt. He's just got to make sure he's staying on top of the ball and pitching down in the zone. If he does that, he'll see results." Contrary to what Steil said, when May reached the major leagues he saw better results on his fastball when it was above the belt. Opponents hit .182 with 11/6 strikeouts/walks against his high fastball compared to a .313 average with a 7/9 strikeouts/walks when pitching the fastball down in the zone. Both are small sample sizes yet there may be something there. After all, Baker and Phil Hughes have had success while almost exclusively using high fastballs. If he is able to command it May might be better off using the upper reaches of the zone. To be clear, effective pitching is not just throwing fastballs up in the zone. It is proper sequencing, changing speed and locating pitches. Still, the game has shifted away from the idea that you have to throw fastballs down in the zone. The Twins have been criticized for not thinking differently and maintaining practices that have proven ineffective as the rest of the game has evolved around them. The new hire has the opportunity to make these philosophical and practical changes that can improve the team. What a great piece of analysis, Parker! Thank you. If I had a dollar for every time a hitter launched a low fastball into the bleachers, followed by a lazy "he left that pitch up" by Blyleven, I'd buy y'all a beer and a shot. No no no Parker. Don't you know? Only lefthanders like the ball down in the zone - down and in, that is. Because, well, they're lefthanded, that's why. Love, Love this article. Too bad Steil doesn't have access to the same information as you. This doesn't detract whatsoever from your point, but I was struck after reading the two linked articles containing all of Anderson's comments by the fact that the two things he's criticized for, throwing strikes and keeping the ball down, took a back seat to a half-dozen other things. In fact, throwing strikes was not mentioned once outside of the context of maintaining command. So in fairness, we shouldn't disparage the poor guy as single-mindedly calling for those things, but it's also likely that your analysis would contain new material for the man. All of these things were brought up by Anderson more often, even a lot more often, than keeping the ball down: using all pitches, changing speeds, not rushing, moving the ball around and changing locations, staying under control, and maintaining an arm slot. Edited by birdwatcher, 12 November 2014 - 01:02 PM. Maybe we should send a link for this article to Steil and the five dozen pros who report to him. No matter who becomes the new pitching coach, my sincere hope is that they have a philosophy about learning and adaptation that the rest of the new staff seems to be offering. I don't know much of anything about the new assistant hitting coach, but certainly Brunansky and Molitor have said all the right things so far about being willing to really look at the data instead of repeating the mantras that made them successful as players, or that other coaches have preached to them in the past. A change in leadership should hopefully bring a "leadership of change" - coaches that are willing to adapt to their players' strengths, and the knowledge and humility to understand their players' shortcomings. It seemed from the armchair perspective that Glynn brought that level of adaptation and awareness to his AAA teams, they performed very well while he was at the helm, and based on the constant carousel of players shuttling up to the big club and back the last three years, the success of Rochester seems like it was built on flexibility and a willingness to embrace change. So, hopefully the new pitching coach will bring that same level of open-mindedness. So in fairness, we shouldn't disparage the guy as single-mindedly calling for those things, but it's also evident that your analysis would contain new material for the man. No, this was not meant to disparage Anderson. It was meant to highlight the mentality that the organization has for fastballs down in the zone. All of the things he listed are fine and are what made him a solid pitching coach. The difference is the game, in terms of fastballs and how offenses have developed, have changed. I also noticed that May did well up in the zone with the fastball.Should probably note a couple things though. Hitters don't appear to have adjusted to generations of curveballs, changeups and sliders down in the zone and don't appear to be unable to square up those pitches up in the zone. Fastballs with sink still appear to be better down in the zone. I never thought May's issue was where he threw strikes but where he threw balls.So often he would get ahead in the count and his next two or three pitches didn't even tempt the hitters because they were so far out of the zone. Just seems with him his location on pitches outside of the strike zone were just as important as the location of his pitches inside the strike zone. I would argue that the best pitch is the fastball on the outside corner and at the knees. But if you get it out over the plate (like any pitch), it's going to get hit. 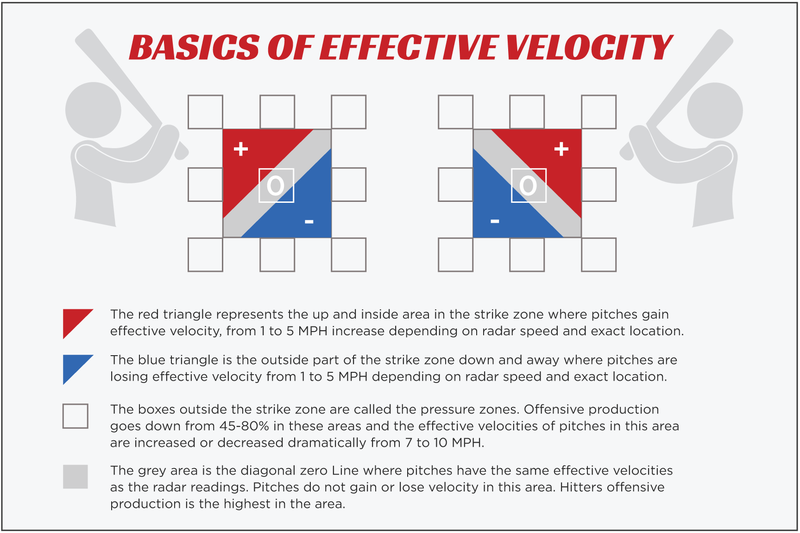 I have talked to several players in the organization, and there has been an effort to have some pitchers work up in the zone, to be a strikeout pitch... I don't know if that's an organizational change or shift. I don't know if that's primarily guys that throw over, say, 94-95? But there was definitely some short of discussion about this. I would argue that the best pitch is the fastball on the outside corner and at the knees. up/in: .197 avg/658 OPS -- 8.9% swinging strike. The biggest difference is the tendency to allow home runs -- down/away: 0.6% vs up/in 2.4% -- which I think pitchers/coaches error far too cautious on. "Escobar's stuff was about as good as it gets," he said. "But at the time I did the study, the league was hitting his fastball combo at a .369 clip. If movement is everything for a pitcher, this guy should have been a world-beater. But if movement is so important, why was he getting killed? "It turned out that he was throwing 97 down and away, which is about 92 EV. Then he throws the cutter to lefties at 92, and the sinker down and in, at about 91. He's throwing all his pitches within 2 or 3 mph of each other [in EV terms], and he's neutralizing all the effects. Even though the movement is there, it's killing him. Guys are getting ready for one pitch at one speed, and receiving two bonus pitches at the same speed. He was throwing pitches that moved right into hitters' bats, even if they were guessing wrong." Had Escobar reversed himself, he could have created a spread of up to 16 mph utilizing exactly the same pitches. Husband paused for a moment, and sighed. It is good to hear that somewhere in the organization pitchers are working on going up in the zone. Yes, I very much appreciate that you aren't one to unfairly disparage Anderson, and I agree that, although he was a solid pitching coach, it's time for a change and time to fully embrace the sources of all this valuable new information. We all know the Twins can't be accused of being early adapters, and it'll be interesting to see if there's some early evidence of a changed mentality in light of how the game is evolving. To be clear, effective pitching is not just throwing fastballs up in the zone. It is proper sequencing, changing speed and locating pitches. Often with Baker and Slowey, it wasn't.That's probably partly due to the fact they weren't conditioned to do so.Baker's average against might look better high in the zone, but I don't think that tells an accurate or complete story.The chart below shows Baker's RAA/100 (runs above average per 100 pitches) and it seems clear that damage was done against him high in the zone.This same chart looks quite different for a guy like Trevor Bauer.It seems like a stretch to use Baker as an example of someone who should have pitched up more often. I agree in full that the new pitching coach needs to be able to synthesize the data to make each pitcher effective in whatever manner that might be -- strikeouts, contact, pitching down, pitching up, fly balls, groundballs, etc. Great stuff Parker, I'll bet this one gets picked up by national sites that enjoy knowledgable baseball analysis. This kind of research shows why analytics are important.Not so much because of the data they produce, but more so to demonstrate that traditional long-standing philosophies are not always accurate or no longer accurate.This game is always evolving, every assumption made earlier than a week ago should be re-evaluated. 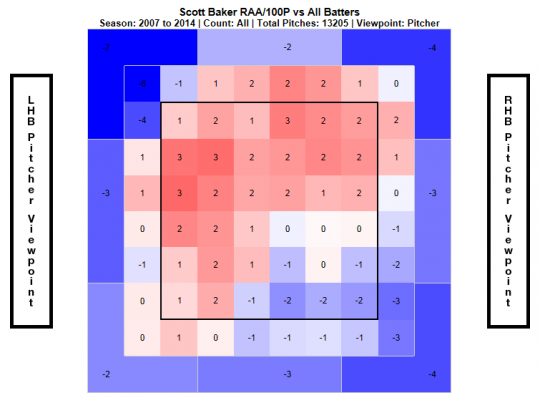 The chart below shows Baker's RAA/100 (runs above average per 100 pitches) and it seems clear that damage was done against him high in the zone. For starters, the chart you are showing is ALL pitches and not just fastballs. The reason his RAA is higher up in the zone is because -- dating back to 2009 -- he was susceptible allowing home runs on balls up in the zone (21 fastballs up/6 fastballs down). However, he was much better at getting outs on fastballs up (70.5% OUT%) compared to fastballs down (59.7% OUT%). From 2009 on opponents hit .227 and struck out on 24% of their plate appearances while facing fastballs up in the zone against Baker. On the other hand, they batted .288 with strikeouts on 11% of their plate appearances on fastballs down. His success was found just below the letters. It seems to me that the Twins were emphasizing a philosophy of "...do things this way, not your way...".I could add that this philosophy crossed-over to the other elements of baseball.Adaptability is crucial.All opponents don't hit the same way, nor are effective in the same manner.The pitcher needs to seize on opponents weaknesses and exploit them, even if that requires pitching differently than normal. Wow, I'm always amazed by your analysis, Parker and by how clearly you explain it. The dome and the state of the organization made the Twins heavily favor groundball staffs.Now Target Field is nice and spacious and the organization is moving away from the dark ages some.It scares me that Bert and Jack Morris are being talked about as pitching coach candidates, I like them both in the booth but keep them the hell away from the pitching staff. Article: Can The Twins Find Hitting Inspiration Up North?